Got a last minute girls night planned and looking for night out dresses? We also do next day delivery and can even get your dress to you by same day delivery within central London. Maybe you’ve got an evenT planned for the future such as a wedding or a black tie event but you’ve been too busy to sort your hire out – don’t waste any more time and save with our fantastic offer. With our vast rage of designer dresses to hire you’re sure to find something you love for whatever event you’ve got coming up or even just a dress for the weekend. 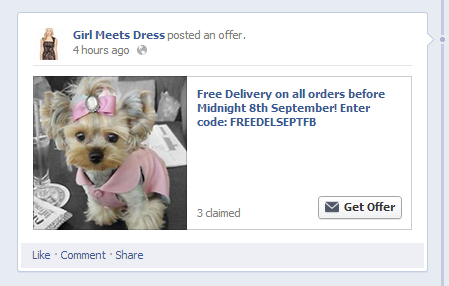 With dresses starting from £29 and free delivery you can live the designer dream for less than £15 a day. Go like our Facebook page now for the opportunity to claim this offer. Hurry -it ends on Sunday! Posted September 5th, 2013 in Offers & Competitions. Tagged: Designer dresses, free delivery, hire designer dresses, offer.